LOCATION.--Lat 42°19'10", long 74°26'12" referenced to North American Datum of 1983, Greene County, NY, Hydrologic Unit 02020005, on left bank 100 ft upstream from bridge on State Highway 23 in Prattsville, 0.2 mi upstream from Schoharie Reservoir, 0.2 mi downstream from Huntersfield Creek, and 1.6 mi downstream from Batavia Kill. PERIOD OF RECORD.--November 1902 to current year. REVISIONS HISTORY.--WSP 1432: 1937-38. WDR NY-87-1: 1956(M), 1972(M), 1974-76(M), 1978(P), 1979(M), 1980(P), 1981(M), 1984(M). WDR NY-90-1: Drainage area. WDR-US-2012: 2011. GAGE.--Water-stage recorder and crest-stage gage. Datum of gage is 1,131.57 ft above NGVD of 1929 and 1,131.13 ft above NAVD of 1988. Prior to Oct. 1, 1915, nonrecording gage, and Oct. 1, 1915 to July 17, 1936, water-stage recorder, at old highway bridge 80 ft upstream, and July 18, 1936 to July 15, 1954, water-stage recorder at site 0.2 mi downstream, all at datum 1.56 ft lower. REMARKS.--Seasonal diversion for snowmaking by Hunter Mountain ski area near Tannersville and Ski Windham ski area at Windham. EXTREMES FOR PERIOD OF RECORD.--Maximum discharge, 120,000 ft³/s, Aug. 28, 2011, gage height, 24.38 ft, from floodmark in adjacent gage house, from rating curve extended above 18,000 ft³/s on basis of contracted-opening measurements at gage heights 18.37 ft and 19.14 ft and slope-area measurement at gage height 24.38 ft; minimum discharge not determined. 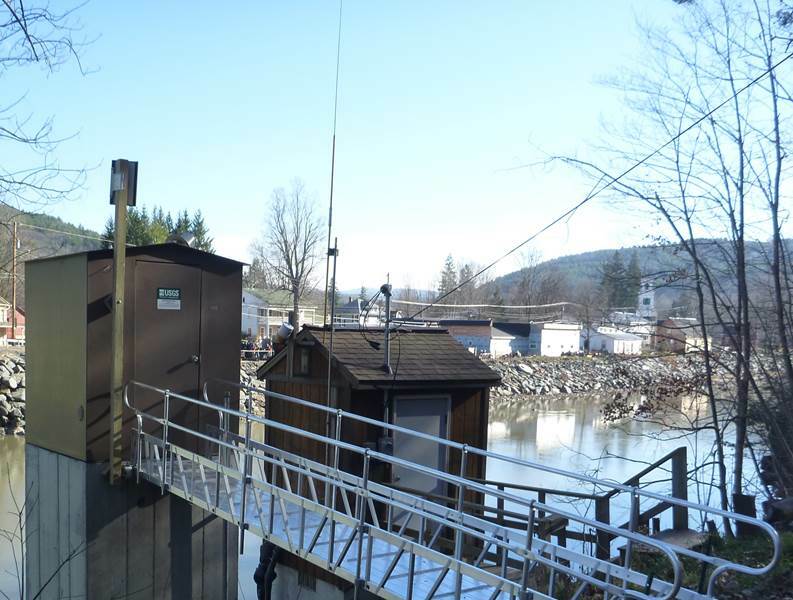 This streamgage supports a flood inundation map (FIM) library for this area.